Built on technology dating back to a few decades, the national power grid and its supporting infrastructure have become increasingly outdated and are struggling to meet the demands of today. Upgrading the power grid on a national level is a very complex process, which involves replacing equipment on a case-by-case basis to maintain costs. There is a need to not only upgrade the existing power grid but also provide regular maintenance to ensure reliability. Further, the growing shortage of technical experts is another factor impeding the transition to smart grids that are cleaner, reliable, more efficient, and secure. RHM International, a specialist in high-quality proprietary dry type insulation designs for safe, maintenance-free operations and lasting performance, provides oil, gas and paper-free insulation based products that are essential for realizing an economical, safe, and environmentally friendly power distribution system. 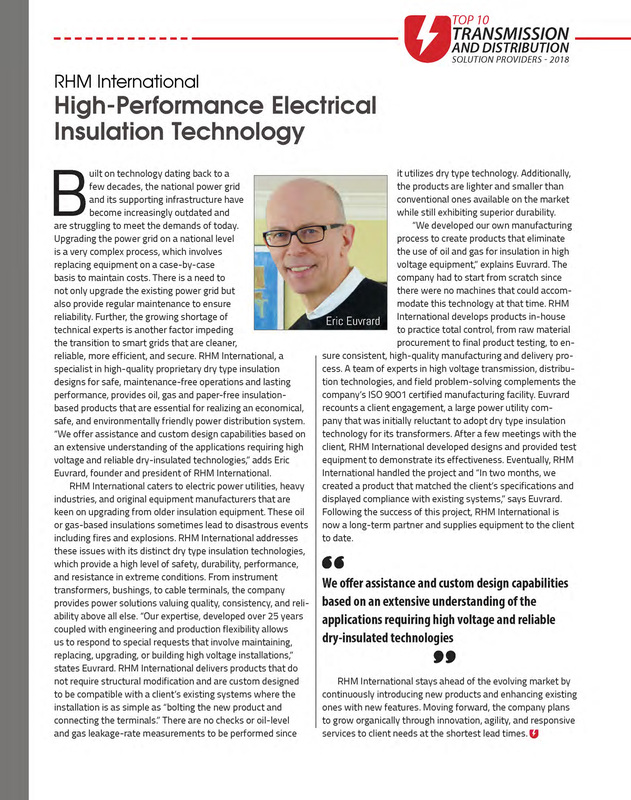 “We offer assistance and custom design capabilities based on an extensive understanding of the applications requiring high voltage and reliable dry-insulated technologies,” adds Eric Euvrard, founder and president of RHM International. RHM International caters to electric power utilities, heavy industries, and original equipment manufacturers that are keen on upgrading from older insulation equipment. These oil or gas-based insulations sometimes lead to disastrous events including fires and explosions. RHM International addresses these issues with its distinct dry type insulation technologies, which provide a high level of safety, durability, performance, and resistance in extreme conditions. From instrument transformers, bushings, to cable terminals, the company provides power solutions valuing quality, consistency, and reliability above all else. “Our expertise, developed over 25 years coupled with engineering and production flexibility allows us to respond to special requests that involve maintaining, replacing, upgrading, or building high voltage installations,” states Euvrard. RHM International delivers products that do not require structural modification and are custom designed to be compatible with a client’s existing systems where the installation is as simple as “bolting the new product and connecting the terminals.” There are no checks or oil-level and gas leakage-rate measurements to be performed since it utilizes dry type technology. Additionally, the products are lighter and smaller than conventional ones available on the market while still exhibiting superior durability. “We developed our own manufacturing process to create products that eliminate the use of oil and gas for insulation in high voltage equipment,” explains Euvrard. The company had to start from scratch since there were no machines that could accommodate this technology at that time. RHM International develops products in-house to practice total control, from raw material procurement to final product testing, to ensure consistent, high-quality manufacturing and delivery process. A team of experts in high voltage transmission, distribution technologies, and field problem-solving complements the company’s ISO 9001 certified manufacturing facility. Euvrard recounts a client engagement, a large power utility company that was initially reluctant to adopt dry type insulation technology for its transformers. After a few meetings with the client, RHM International developed designs and provided test equipment to demonstrate its effectiveness. Eventually, RHM International handled the project and “In two months, we created a product that matched the client’s specifications and displayed compliance with existing systems,” says Euvrard. Following the success of this project, RHM International is now a long-term partner and supplies equipment to the client to date. RHM International stays ahead of the evolving market by continuously introducing new products and enhancing existing ones with new features. Moving forward, the company plans to grow organically through innovation, agility, and responsive services to client needs at the shortest lead times.